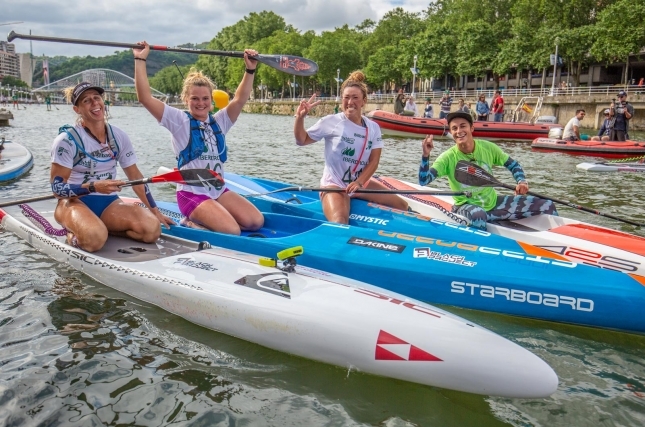 Boothy won the Iberdrola Bilbao SUP Challenge to cement his spot on top of the world rankings, however his compatriot Lincoln Dews gave the champ a fright with a lightning fast final two kilometres that saw him break away from the 11-man chase group and get within shouting distance of the powerhouse. But in the end Boothy’s lead was simply too big, which made it a race for second that Linc deservingly won. Mo Freitas was right behind Lincoln in third after making a great move at the final buoy 2k from home, while Titouan Puyo managed 4th as a big pack of big names surged to the line. The women’s finish was even more exciting as it was a race for first, not second, with Olivia Piana and Seychelle side-by-side for the final kilometre in an all-out drag race to the line. With 100 metres to go it was still anyone’s race, but the Frenchwoman surged and relegated Seychelle to the runner-up position. Olivia’s victory makes it two on the trot in Europe after saluting in San Sebastian seven days ago. Fiona Wylde was strong in third not far off the leaders, while the smiling assassin from Japan, Yuka Sato, surged in the second half of the race to claim 4th. The under-rated Aussie/Brit Kate Baker rounded out the top five. The race was billed as a flat water event, however it was anything but as the stone walls along Bilbao’s inner-city river refracted every little bit of wash off the 200+ race boards and turned the course into a washing machine. Great to see record registration at this event (272 in total), and thanks for everyone that tuned in live on Facebook. We’ll have full recap, results and photos up shortly, but in the meantime here’s the live stream replay. We apologise that not all times are available; we had some issues with the timing system. We’ll try and get all positions updated in the coming days.